You Magnificent Bastards: Skaven at Adepticon! I registered for my first Adepticon, and I'll be playing in the Warhammer Fantasy Championship. Adepticon is releasing their comp scoring guidelines for Skaven on Feb. 2nd, so I am eagerly awaiting the massive penalties for all my goodies and having to then fit what I want back down into 2000 points. 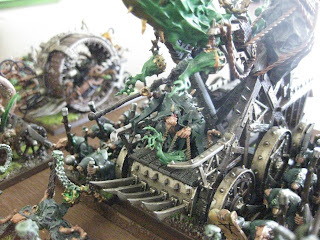 I am thinking I will probably have to paint another unit or two of rats, and I will finally have to paint my Warlord on a Warlitter conversion I did way back when the book was released. I have been playing a Grey Seer in the GLWL and most other pick-up game, but for Adepticon I will need the comp boost a Warlord gives me if I want any chance of taking my rare slot goodies. Anyone else prepping for a trip to Chicago? I'm jealous. I'd love to go to Adepticon, but March is always such a damned busy time of the year for my family.